Cordyceps Sinensis, also known as “Winter Worm, Summer Grass”, is a rare and exotic medicinal mushroom that has been used for a long time in China and Tibet, for at least a thousand years according to the written record. It has always been very highly regarded, but it has also been the most expensive herbal raw material in the world. This is because it only grows at high elevations in the Himalayas around Tibet and Nepal and in small border sections of India and China. The high altitude makes its collection difficult, and this rarity of Cordyceps has limited its use by the general public. The great demand and the limited supply act to drive the price up, sometimes to as much as $35,000 a pound! The scarcity and high price lead many people to try to cultivate Cordyceps like a normal farm product. But unlike the common button mushroom that we find on pizzas worldwide, Cordyceps proved to be extremely difficult to grow. It was not until 1972 that the first successful Cordyceps cultivation was achieved. The first Cordyceps cultures were isolated by the Chinese Academy of Sciences in that year. These strains were not isolated from Tibet, where most of the top quality Cordyceps comes from, but rather they were isolated from specimens found in Qinghai province in Central China. Originally three different strains of Cordyceps were isolated. The first three strains, named CS-1, CS-2 and CS-3, did not have the fast growth characteristics that make commercial cultivation practical. It was the fourth culture that had been isolated by this institute, named CS-4, that was hardy and fast growing. So this CS-4 strain was chosen for commercial production. Different strains in mushrooms are like different breeds in dogs. Chihuahuas and Golden Retrievers and Great Danes are all dogs, but they are all quite different in terms of size and personality. They are not alike at all. Or consider apples, different strains like the Red Delicious, or the green Granny Smith apples, or the Yellow Delicious apples are all apples, but they taste quite different, and they have different sugar content and even different textures and uses. Or as a scientist would say, they all have a different “Analytical Profile”. Not all Cordyceps are the same, just like not all apples or all dogs are the same. 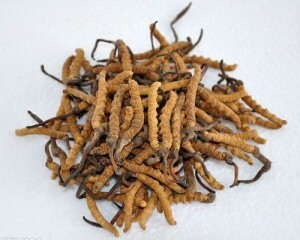 Cordyceps Sinensis has been used in traditional Chinese medicine as a cure-all. Chinese use it to heal lung, heart and kidney diseases, to treat fatigue, cancer as well as male and female sexual dysfunction, to relieve pain, to enhance overall health, and to promote longevity. Due to its rarity, and legendary efficacy against a variety of health conditions, Cordyceps has held, and continues to hold, a highly esteemed position in the vast ranks of Chinese herbal remedies. Most people in the West have come to know this once rare herbal medicine in only the last twenty years or so, thanks to the advancement in modern cultivation technology. Those techniques have dramatically lowered the cost of consumption, and have allowed for more in-depth research into Cordyceps healing potential. Today, modern scientific research has proven what Chinese practitioners have noted for centuries. Numerous clinical trials have proceeded to scientifically prove that Cordyceps works well in treating and healing a myriad of medical problems. Traditionally used to increase vitality, alertness, and virility, Cordyceps is now favored by Olympic athletes and training enthusiasts to improve physical performance and endurance. Research suggests that Cordyceps may improve the BIO ENERGY status of animals and humans. This would happen because Cordyceps improves the internal balance mechanism, thus making the utilization of OXYGEN more efficient. These properties may account for the overall physical enhancement, the added endurance, and the anti-fatigue effects which are seen in individuals using the Cordyceps supplement. Cordyceps is best known medicinally for increasing physical stamina. It can cause a change in the biological action that allows for an increase in cellular oxygen absorption by up to 40 percent. In 1993, the Chinese National Games brought this mushroom to the attention of the world’s sporting authorities. A group of nine women athletes who had been taking Cordyceps shattered nine world records. There have also been many reports of amazing improvements in performance in various sports due to the intake of Cordyceps. This has led to talk of possibly banning Cordyceps from sporting events as it could give an unfair advantage to those who are able to benefit from it. Nowadays, most professional athletes who use it will not admit that they do, since there is a possibility that some sporting authority will outlaw its use. However, the Canadian Olympic Committee has taken an official stand on Cordyceps, ruling that it is allowed in professional competition. Another benefit of Cordyceps sinensis is that is has also been shown to improve liver functions. The liver is the living filter of the body, cleaning the blood and all other fluids of impurities. Without a functioning liver, the body cannot survive. The clinical research in controlled studies has revealed that elderly patients suffering from fatigue and senility- related symptoms reported relief in these areas after using Cordyceps for only 30 days. Various studies have shown that Cordyceps sinensis improved the flow of blood in the body by relaxing the smooth muscles of the blood vessels and allowing them to expand, and also enhanced the functioning of the heart and lungs. Still, the best-known medicinal action of Cordyceps sinensis is the increase of physical stamina, or endurance, since Cordyceps has been shown to improve the internal balance mechanism, causing oxygen to be utilized more efficiently. The exact origin of turmeric is not known but it originates from South or Southeast Asia, most probably from western India. 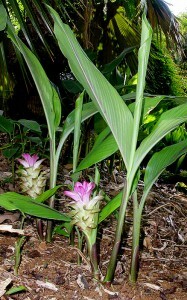 Turmeric is a sterile plant, and does not produce seed. It is thought to have arisen by selection and vegetative propagation of a hybrid between the wild turmeric (Curcuma aromatica), native to India, Sri Lanka and the eastern Himalayas and some other closely related species. Turmeric has been grown in India since ancient times. It reached China by 700 AD, East Africa by 800 AD and West Africa by 1200. It was introduced to Jamaica in the 18th Century. Today, turmeric is widely cultivated throughout the tropics. Turmeric was probably cultivated at first as a dye, and then became valued as a condiment as well as for cosmetic purposes. It is often used in cooking as a substitute for the more costly saffron. In the 13th century Marco Polo wrote of this spice, marvelling at a vegetable which exhibited qualities so similar to saffron. Familiar to the contemporary world as a prime component of curry powder, the orange-yellow rhizome’s striking colour lent it a special aura in ancient India. It has always been considered an auspicious material in the sub-continent, both amongst the Aryan cultures (mostly northern) and the Dravidian cultures (mostly southern) and its value may extend far in history to the beliefs of ancient indigenous peoples. Turmeric’s common name in the north, haldi, derives from the Sanskrit haridra, and in the south it is called manjal, a word that is frequently used in ancient Tamil literature. Turmeric has a long history of medicinal use in South Asia, cited in Sanskrit medical treatises and widely used in Ayurvedic and Unani systems. Susruta’s Ayurvedic Compendium, dating to 250 BC, recommends an ointment containing turmeric to relieve the effects of poisoned food. Turmeric has analgesic and anti-inflammatory properties and can help you avoid discomfort associated with strength-building postures by reducing the buildup of free radicals that occurs as your muscle tissues consume oxygen; this also reduces post-practice pain and recovery time. 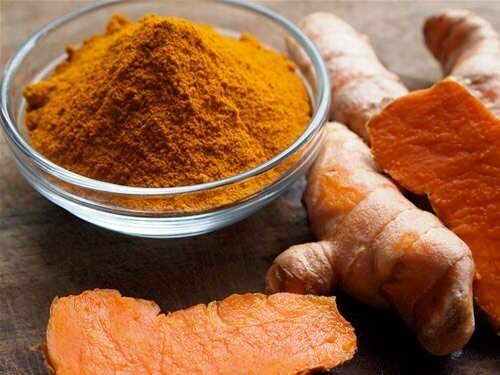 Research published in the 1993 Journal of Ethnopharmacology (vol.38) showed turmeric to be a nutrient for connective tissue, stabilizing the collagen fibers and preventing adhesions caused by stress and overstretching. Traditionally, turmeric is said to provide the energy of the Divine Mother and grant prosperity. It cleanses the chakras, purifies the channels of the subtle body and helps stretch the ligaments and, therefore, is highly recommended for the practice of hatha yoga. Mixed with honey, turmeric can be used externally for sprains and strains. Cinnamon bark is known throughout Asia for its ability to strengthen, warm, and harmonize the flow of circulation into the muscles, joints, and bones. And in the Taoist yoga systems of the Far East, a combination of peony root and licorice root is used to reduce muscle tension. On the path of yoga the opportunity to cultivate flexibility is a gift that comes to us in many forms in addition to asana. It is a simple alchemy found in the way we live and work, our diet, emotions, and the karmic actions that affect the physical and subtle body. In a society where we look for the answers to our suffering in a pill, we must not forget that nature has given us herbs not only as remedies but also as special energetic foods to help us grow in our lives and, most especially, in our yoga practice. Brahmi-Gotu kola, the brain food of herbs, has long been prized by students and yogis for its memory-enhancing properties. Native to Sri Lanka and South Africa, gotu kola extract and herb has been used for centuries to relieve mental fatigue, and as a tonic for overall brain and nervous system support. Rich in vitamins A, B, E, K and magnesium, researchers have found that it also contains several glycosides that exhibit healing properties. Taking Brahmi-Gotu Kola increases circulation and oxygen flow to the brain which increases energy without taxing the adrenal system. Brahmi-Gotu Kola is extremely powerful in helping to support memory, enhance physical, mental, and emotional clarity, and promote longevity. Brahmi-Gotu Kola is a fabulous nutritive “long-life” adaptogen, with potent antioxidants that have special affinities for the brain and nervous system as well as circulation. 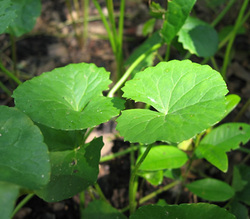 Brahmi-Gotu Kola is one of the world’s most powerful adaptogenic herbs. It helps replenish and nourish the nervous system. It promotes increased circulation to the brain and increases energy without stimulating the adrenals. It contains approximately 10% phenols, which are powerful antioxidants supporting anti-aging properties. Research has shown that Brahmi-Gotu Kola enhances memory function. It is calming to the nervous system, decreasing anxiety and mental fatigue. It lifts mood and enhances concentration. The ABC’s of Brahmi-Gotu Kola are adaptogen-brain-circulation.